Nothing is better at Christmas than gathering with those you love to create new memories, and what better way to do that than around a cozy dinner table? 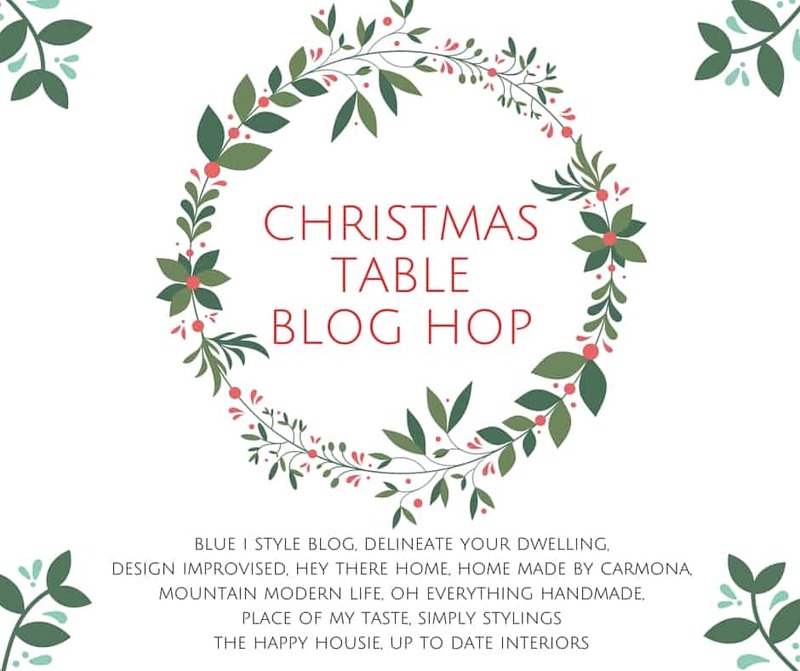 That’s why I teamed up with 10 other bloggers to bring you some holiday table decorating ideas, including our cabin inspired Christmas tablescape. I’ll be honest and say we rarely actually eat in the dining room unless it’s a holiday, special occasion or we have family or friends visiting. That’s not to say it doesn’t get used….it’s just more of a craft/project table than a dining table most of the year. Eric built this table, and I stained/painted it so it feels extra special to us for that reason. I honestly can’t wait to have kids and enjoy dinner at this table with them. My mom will be “borrowing” it while we are on the road for a year, so that was even more reason to dress it up for Christmas. This year I wanted something simple, rustic and cabin-inspired. Shocking, right? I’ve been struggling this year a bit when it comes to buying items for the home. We’re moving into an RV in a few months and although it may only be for a year, I don’t want to buy a lot of stuff just to have it end up in storage, ya know? Although I mixed old and new items in our table decor, the majority of what was used we already had on hand. It was just a matter of shopping our home. However, when I do go out shopping I make sure I absolutely love something before I bring it home. I also try to decide if it’s something we can possibly use in the RV, where space is limited. Most items don’t pass the test, but a few certainly slide by. This was the case for the kilim-style table runner I used on the table. It was a HomeGoods find and I love the texture, pattern, and that it’s not holiday specific. It’s warm and cozy and it makes me happy. #homegoodshappy. That’s also where I picked up the placemats. I love that they’re square and the texture adds another layer of interest to the table. The dinner plates were purchased waaaay cheap at JCPenny several years ago and the smaller plates were a wedding gift. As for the napkins, I made them out of leftover buffalo plaid fabric I had purchased last year and sprinkled around our 2014 Christmas home tour. I had all of these random scraps of fabric which just so happened to work perfectly. Okay true confession, a couple of them are different sizes but unless our guests decide to compare napkins I doubt anyone would notice. We purchased a few galvanized letters from Hobby Lobby to use as ornaments on our tree year and I thought it would be fun to pick up extras for our guests and use them as place-settings. They’d also be fun to hang as monograms on stockings. I love the vintage-rustic charm it adds to the table, don’t you? And the silverware I picked up right before Thanksgiving. We needed new silverware for the RV anyway and I became obsessed with this rustic design I found at World Market. They are a bit heavy but I love the character they add to the table and now my silverware brings me joy. For the centerpiece I tossed some pinecones into an apothecary jar and mixed in some fairy lights. The silver candle holders were a thrifted find a couple years back that I love. We even used them at our wedding. I filled a couple vintage mason jars with epsom salt and bottlebrush trees and then attached a tea-light candle to the lids using a command strip. I’ve seen fairy lights in jars before but saw the tea-light trick on Tiny House Nation a couple weeks ago and thought it was genius! When playing around with what cups to use on the table, I really loved how my copper mugs looked but I only have 2 and wasn’t about to go out and buy 4 more. I then contemplated using them just at then ends of the table but decided against it. I really like the copper and gold detail on faceted glasses I’ve seen around and decided to attempt to DIY my own version. These glasses were a great find and actually made their way onto my very first fall tablescape a couple years ago. Although I wanted to use copper, my copper craft paint wasn’t looking right so I decided to use some liquid gold leaf I had leftover from previous projects. I painted that onto the bottom section of these glasses and am really impressed with how they turned out. You can see how I made the gilded glasses here. I also made a few small wreaths from the trimmings I snagged for free from Home Depot and added them to the back of the chairs. And that’s pretty much it for our cabin inspired Christmas tablescape. It’s simple, rustic and cozy. So, what do you think of our cabin inspired Christmas tablescape? Don’t forget to visit the blogs below for even more Christmas table inspiration! So pretty! The perfectly rustic Christmas table, love the red plaid napkins!! What a beautiful rustic yet cozy table scape, the metal letters are so adorable. And your mason jars with the light, snow and Christmas tree would make my kids go woooooaaahhhh. Gorgeous, …love everything about it! Beautiful Katie!! So cozy and welcoming – I love all the layers you added!! The wreaths and the plaid are perfection. Such a beautiful table! I love how resourceful you were with this gorgeous table setting. It looks so expensive! We are kinda of in the same boat with a weight limit of our belongings when we move back to the states so I can’t buy a lot while we are out here. 🙁 boo. Love everything about your table but my favorite is that it’s so cozy and inviting! Merry Christmas Katie and I can’t wait to hear more about your RV adventure.